VANCOUVER, British Columbia, Canada, May 11, 2014 (ENS) – A Vancouver beach was crowded Saturday with more than 1,000 demonstrators opposed to the Enbridge’s controversial C$6.5 billion Northern Gateway oil pipeline. Held at Sunset Beach, the protest was one of nearly 100 demonstrations against pipelines, oil tankers tar sands development held in cities and towns across Canada, as part of a national day of action against climate change. 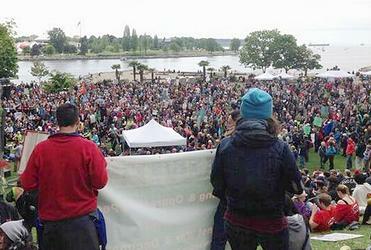 “First Nations stand strong against Enbridge, the B.C. government has formally opposed their Northern Gateway pipeline proposal – and the people of B.C. are not going to let this monstrosity ever be built,” West declared. Organizers across the country said a united wall of opposition led by First Nations, backed by local governments, hundreds of large and small grassroots organizations, and masses of citizens will do whatever it takes to stop the proposed oil pipelines and tankers. It was the second big demonstration against the Northern Gateway pipeline in Vancouver, after about 5,000 people attended a rally at Science World in November 2013. In December, a Joint Review Panel of Canada’s National Energy Board recommended that the federal government approve the Enbridge Northern Gateway Project, subject to 209 required conditions. Canada’s Conservative government led by Prime Minister Stephen Harper is expected to permit or reject the Northern Gateway pipeline early next month. Demonstrators in towns and cities across British Columbia also opposed the proposed C$5.4 billion expansion of Kinder Morgan’s Trans Mountain Pipeline between Edmonton, Alberta, and Burnaby, British Columbia. If approved, this expansion would triple the number of barrels per day flowing through the pipeline and increase the number of oil tankers transiting Vancouver’s narrow Burrard Inlet from two or three a month to several every day. In Quebec on Saturday, members of the STOP Oleoduc [STOP Pipelines] movement and people from across Quebec united to launch the Coule pas chez nous! campaign simultaneously in three cities: Cacouna, Quebec City and Montreal. Coule pas chez nous! aims to raise awareness about the risks associated with the Energy East and Line 9B pipeline projects, as well as the risks of tar sands exploitation in Alberta. In 2013, Calgary-based TransCanada launched the Energy East project to transport 1.1 million per day of crude oil through a pipeline 4,500 km from Hardisty, Alberta to Saint John, New Brunswick. The proposed Energy East project would convert an existing natural gas pipeline to an oil pipeline; construct a new pipeline in Alberta, Saskatchewan, Manitoba, Eastern Ontario, Quebec and New Brunswick to link with the converted pipe; and construct pump stations and tank terminals to move crude oil, including marine tanker terminals to ship the oil to overseas markets. “Concerned about the consequences of such a project, we believe that Energy East should not take place. 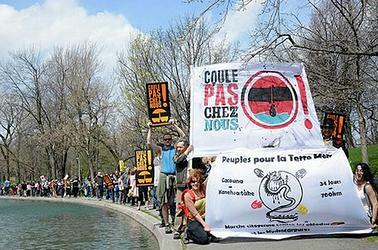 Together, we express our right to oppose,” declared the Quebec demonstrators. The National Energy Board is holding technology information sessions and open houses on TransCanada’s Energy East proposal in late May and June. TransCanada is also responsible for the controversial Keystone XL pipeline proposal the would carry tar sands oil from Hardisty across the Canada-U.S. border to Nebraska. This proposal requires a determination for the Obama Administration that it is in the U.S. national interest and a Presidential Permit to cross the border. This process is stalled by a court battle over the route through Nebraska, which crosses the environmentally sensitive Ogllala Aquifer. 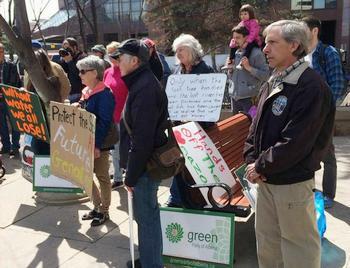 An anti-pipeline rally was held in TransCanada’s home city of Calgary, in Toronto, Ontario; in Halifax, Nova Scotia; and in British Columbia, demonstrations were held in the capital, Victoria, and in many smaller communities. West said the Vancouver rally was a chance to highlight better alternatives to tar sands export projects like the Enbridge pipeline. “There are so many better alternatives to Enbridge that create good jobs we can all be proud of. We will be calling on our elected officials to get serious about giving us the kind of choices we are all so hungry for. Canadians want to be part of the solution, not part of the problem,” said West. Vote pledge cards were circulated as part of organizing for change in the 2015 federal election. Opportunities were be provided to sign up for safe non-violent direct action training. Already over 20,000 people have signed on to the Yinka Dene Alliance’s online request for people to be involved in direct action.